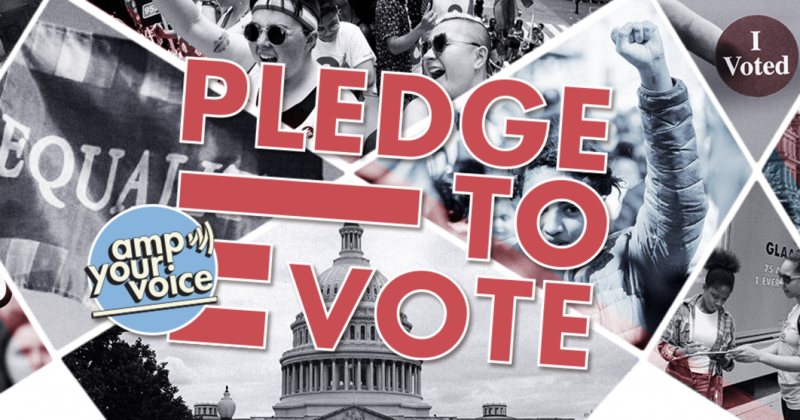 This National Voter Registration Day, register to protect queer and marginalized youth from state and local representatives using their political platforms to target their most vulnerable constituents. Click here to register and take the pledge to vote. According to PBS, only 36.4% of all eligible voters participated during the 2014 Midterm Election, the lowest overall turnout in seventy years. In response to the last two years under the Trump administration, many people believe the 2018 Midterms are best chance to resist our way back into power. But if history taught us anything, we can’t rely on predictions. We cannot afford to be complacent. We cannot expect others to vote on our behalf. The calculus of voting theorizes that an electorate will only vote if their perceived benefit combined with their civic duty is greater than the overall cost of voting. In order to inspire LGBTQ+ voters to participate in democracy, it is critical that the benefits of voting are made clear. We must demand that our candidates represent intersectional and relevant issues to all LGBTQ-identified voters. And we, the LGBTQ+ electorate, need to vote for progressive policies that promote safety, security, and equality—no matter where we live. This initiative starts with grassroots mobilization of LGBTQ+ voters participating in local elections. We must vote out anti-LGBTQ+ representatives hiding in the shadows of progressive states and those who publically express their homophobia and transphobia through bigoted policies. When we think of states like Oregon, Connecticut, California, and New York, we often think of champions and leaders of the legalization of LGBTQ equality. As activists, we feel as if our work is better spent in those states that stand in harsh opposition to our community. Meanwhile, anti-LGBTQ representatives in equality states are making it harder and harder to be queer in their districts. As a nonbinary queer person growing up in Connecticut, I was fortunate to experience an accelerated acceptance towards the LGBTQ community. In my hometown, however, the climate has always been much different than that of the state overall. State Representative Rob Sampson has routinely spoken and voted in favor of discrimination on the basis of sexual orientation and gender identity. In May 2017, Rep. Sampson voted against HB 6695 to preserve the outdated and dangerous practice of conversion therapy thought to convert LGBTQ youth to a perceived heterosexual or cisgender “norm”. Studies show that this practice is both ineffective and incredibly damaging to the mental health of young people. There is a nationwide epidemic of local politicians flying under the radar while discriminating against the LGBTQ community. Rep. Greg Barreto of Oregon voted against HB 2307, a bill that prohibits practices of conversion therapy on minors. While Oregon is known to be forerunner in equality, many state representatives voted against these protections. California is a firmly pro-LGBTQ state, however 32% of the State Legislature is comprised of representatives who routinely vote against equality. In 2016, Rep. Brian Dahle voted against AB 1732, a bill that requires single user restrooms to be gender neutral. Dahle also voted Nay on AB 1266, a bill that desegregated school programs and activities based on gender. Unfortunately, these are not single votes. AB 1732 received 19 votes of Nay from Republican members of the state legislature. In 2017, The New York Times deemed New York State as one of the best places in the country to identify as LGBTQ. Meanwhile, Rep. Dean Murray cast votes of against S 1523, a bill allowing unmarried partners to adopt a child, A 4953, a bill that classifies conversion therapy on minors as professional misconduct, and A 8354, enacting marriage equality statewide. This issue runs much deeper than policy. The language and rhetoric often used by these politicians in regard to issues of gender and sexuality directly belittles the humanity of vulnerable youth needing local voices with the courage and knowledge to represent them fairly as they grow. The era of flagrant civil rights abuses in the age of Donald Trump has left marginalized communities nationwide disempowered and voiceless. We live beneath the power of a President who will tweet away our rights quicker than he will condemn those who murder us, a Republican-majority Congress that perpetuates divisive and exclusionary legislation, and a Supreme Court that allows a baker to refuse service to a queer couple. This National Voting Registration Day, I urge you to consider the impact of your vote in the state that you live in. Every vote matters to protect and preserve the rights of LGBTQ citizens nationwide. Sections of this article have been reposted from their original source. Leah Juliett is a GLAAD Campus Ambassador and senior at Western Connecticut State University studying political science. They are the Founder and Executive Director of the #MarchAgainstRevengePorn. Leah is a 2018 GLAAD Rising Stars Grant recipient and served as the Youth Engagement Coordinator at GLAAD.